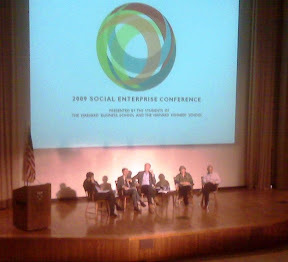 I was lucky to attend the HBS SE Conf 10th Anniversary Keynote Panel. The panel consisted of Bill Drayton, founder of Ashoka and granddaddy of social entrepreneurship, David Gergen, presidential advisor emeritus and ubiquitous political commentator, Jon Greenblatt, founder of Ethos water, and Clara Miller, CEO of Nonprofit fund. More on the panel in a later post.